Gunung Raya is the highest peak of Langkawi island and is one of the most north-westerly mountains of the lands where mountains are called ‘gunung’. Despite its name meaning ‘great’ or ‘big’, it is not be the most impressive peak nor the most interesting trek, but there are some decent views and it makes a very pleasant half-day out on what is a lovely island. The road to the summit. 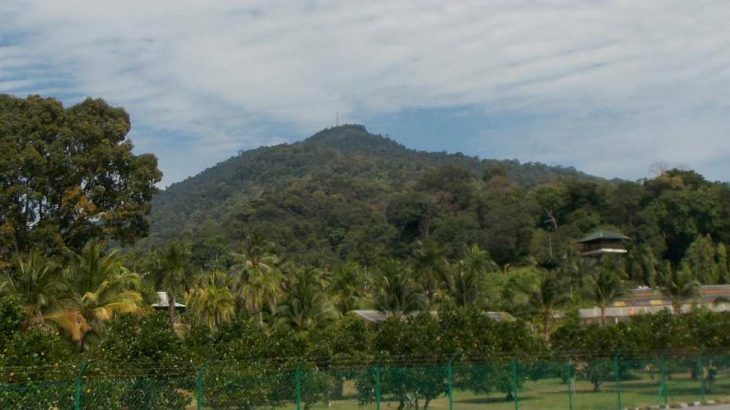 As is all too common in northern Malaysia, there is a telecommunications tower at the top of Gunung Raya. Thus, a well-signposted paved road leads 13 kilometres up to the peak, starting in the west at an elevation of around 35m. From the main road junction it takes around 20 minutes to drive up, or you can hire a taxi from Cenang beach for the 45 minute journey for around RM70 (in 2019). A steep and occasionally overgrown cement staircase leads up from the southwest about 1 kilometre north of Mardi Agro Technology Park (an area sometimes known as Lubuk Semilang). Known as Tangga Helang Seribu Kenangan (‘thousand memories eagle steps’), this 3 kilometre trek that was constructed in 2000-2001 takes you directly up the hillside and allegedly consists of 4,287 steps! It is a little tricky to find – heading north-west on Jalan Padang Gaong (away and inland from Kuah), continue just over half a kilometre past Mardi Fruit Farm and take a right turn near a large orange/yellow sign spelling out Kampung Buku Malaysia (Malaysia Book Village) and park at the small car park (50m above sea level) near a river and recreation area. The steps begin on the right (south) side of the river next to a red warning sign. Watch out for a few fallen trees that have crushed the steps near the beginning of the trail. In order to get around these are a handful of minor detours off the path. This is a great spot for hornbills as you may catch a glimpse of one or two above you as they flap over. The steps have a few minor flat sections and even a couple of descending sections but for the most part it gets steeper and steeper. Leeches are possible during the rainy season. Most folk should be up at the top of the steps in between 2 and 3 hours. This is where the trail meets the summit access road and there is a small lay-by, viewpoint and signboards (790m above sea level). The signboards feature information about hornbill species, the granite rock of Gunung Raya, and the interesting history of nearby Tepor island (‘Pulau Tepor’) whose shape was apparently affected by an ancient meteorite impact. There are excellent views over to the jagged ridge-line of Gunung Mat Cincang (708m) which is Langkawi’s second highest mountain and probably its most beautiful but has sadly been disfigured with a cable car and sky bridge. Further to the right (north or northwest) is the Andaman Sea and Ko Tarutao, which is over the border in Thailand. This is one of Thailand’s wildest and most rugged islands, with a history as a place of exile and imprisonment extending almost right up to the present day with a Bangkok Post news report from 2013 suggesting the south coast was still a place where Rohingya migrants are extorted and even sold into slavery by human traffickers. The island remains pretty undeveloped, and its name apparently comes from the Malay ‘tertua‘ meaning old and primitive. From the top of the steps, you can continue along the access road towards the true summit. At the junction, going straight ahead simply leads to a gate with Malaysia’s standard trespassing signs (featuring an official shooting a trespasser – hiker? – as he tries to run away). Elevation at this point is around 857m. Taking a right at the junction leads up to an eight-story tower which used to be open to the public (entrance fee RM10 per person) and provided an excellent panorama. Since February 2018, however, this has been closed and replaced with yet another ‘no entry’ sign. Elevation here is around 863m and you are very close indeed to the highest point of the mountain (which is not currently accessible except to telecommunications staff). Believe it or not, there even used to be accommodation and a restaurant up here but in early 2019 all this is closed down and there is not even a place to buy water. It is a sad state of affairs given that this is quite a popular spot with Western tourists who typically hire a motorbike to come up here for sunset. Perhaps in time the viewing tower will re-open but for now it is quite a weird experience. Talking of which, do watch out for guard dogs which may or may not be present at the junction! Rather than hiking up the steps and back down the same way, or driving up and going back down by car, the best way of seeing the mountain is obviously to combine the two if possible. This means either taking a taxi up and then hiking back down the steps (only 1 hour or so down as opposed to over 2 hours up) or hiking up and trusting someone to meet you with transport at the top. The latter would be great for sunset if you started at the bottom around 4 or 5pm but heading down the steps after sunset is not ideal as finding transport at the bottom is not always straightforward. Accommodation: Lots available throughout the island. Permits: Not required, but access to the highest point is currently not possible. Water sources: Take sufficient supplies and assume the restaurants at the top will be closed. Had long wanted to visit Langkawi and was amazed to see a one-way Malaysia Airlines fare from Jakarta via KL for just Rp636,000! Possible as a quick weekend trip too. Unbelievable, on time, and the food onboard was pretty good. Remarkable value. Weird prayer or invocation at the start though, to a being ‘who has placed this transportation at our service, that we ourselves would not have been capable of’. As if the technology arrives fully formed! No mention of the Wright brothers at all! Coming in to land is quite spectacular. From the airport to the popular Pantai Cenang is RM30 in a taxi (just 8km and 20 minutes maximum) and RM25 back from town to the airport. Once off the main street, it is very peaceful, so I recommend staying at one of the homestays or ‘motels’ back in the Cenang village rather than an overpriced resort or noisy place next to the main road. Not a drop of rain all weekend – January and February are the months to go if you like hot, dry conditions. There are plenty of other places of interest I would have liked to have visited – but just didn’t have the time. The Kilim Geoforest Park looks great, apart from the massive selfie sign written across the cliffs themselves – dear oh dear! I was originally thinking about going up Gunung Raya for sunset but I got restless and decided to head out to Gunung Mat Cincang first and then to Gunung Raya. Mat Cincang is the second highest mountain on Langkawi and is quite a beautiful ridge of several peaks, not unlike Ben Loyal in the Scottish Highlands. Sadly it has been disfigured with a ‘sky bridge’ and cable car and is very busy with tourists. Taxi fare from Cenang to include both was RM100. Not cheap so you may want to consider hiring a scooter for the rather short journeys. There were quite a few Europeans pensioners around Cenang which surprised me. When I arrived at the Mat Cincang cable car / sky bridge car park it became obvious why. A huge cruise ship was in town, with 4000 passengers most of whom had the cable car at the top of their ‘things to do in Langkawi’ list. Apparently this happens not every day but certainly several times a week. In short, it was packed at the touristy ticket booths with long queues (unless you want to pay for the express lane which is very expensive) and standing around waiting, surrounded by crowds is not my idea of a good use of time. Especially when the price is unclear with silly ‘combo a’ and ‘combo b’ packages and so on. So I gave up and went back to taxi and we set off for Gunung Raya via the north coast. Some interesting rocky outcrops near Pasir Hitam (Black Sand beach). There are some hot springs near here apparently at Air Hangat / Ayer Hangat. The road up to the gunung is well signposted but the taxi driver had to turn off the AC and wind the windows down to have enough power to get up there. The road itself is pretty good – most Indonesians would be delighted with such a road that is free from potholes and nice and wide. There were 3 or 4 Western tourists at the lay-by at the top of the cement staircase so I got out there. Very pleasant view to Mat Cincang and beyond to Thailand’s Ko Tarutao marine park island. A European chap (German?) emerged a few minutes later from the cement staircase looking absolutely exhausted! I continued my wander to the true peak of the mountain, and was already expecting it to be impossible to bag due to the telecommunications compound. I first went up to the gate with the lovely trespassing signs and then up to the right where the tower is. 3 dogs started barking at me at the junction so do be aware. With proper management this place could be fantastic, but it seems to have become dilapidated since closing in February 2018, with no signs of rejuvenation. There is at least a toilet you can use for the reasonable sum of just 1 ringgit! I strolled back down to the top of the cement steps (5 minutes or so from the highest part of the road) and decided to head back down. The sign suggests 2 hours and 15 minutes for the ascent, so I guessed just over one hour for the descent. Indeed, it took almost exactly one hour to descend from 790m to around 50m. A hornbill flew over me just before coming out at the bottom. Gorgeous. Two other hikers but I think they had just had a quick 30 minutes wander in the forest, looking at how non-sweaty they were. Lovely sound of cicadas in the forests here and you cannot go wrong as there are no junctions at all – just follow the cement steps all the way. A couple of trees have smashed short sections of the walkway to pieces over the years – amazing to see what such weight can do to reinforced concrete! Now, the difficult bit is getting back to civilization from the bottom of the steps here, unless you have a Malaysian phone number and a taxi contact. I walked to the main road and took a left to Mardi fruit farm or agroforestry place or whatever it is called. I hoped they would be able to help as they are the only place for several kilometres. As I approached the ticket booth I spotted the ‘no taxi service’ sign. Oh dear! But I asked anyway. Both of the women working there were very unpleasant, even after I said I would be more than happy to pay for their call charge or whatever, I just needed a taxi back to Cenang. Well, they didn’t want to help at all. You just wouldn’t get that in Indonesia – what is it about Malaysia that encourages this ‘it’s not my problem’ attitude? Is that what development translates as? I have a car, and most Malaysians do, so you can go screw yourself! Very inconvenient for tourists, especially as payphones are almost impossible to find these days. Luckily, a very nice member of the public helped me out by calling a cab for me. Much appreciated. Thumbs firmly down for Mardi fruit farm staff – if you visit the UK I hope you find people slightly more helpful than you yourselves were with me. Taxi fare back to Cenang was RM35. Nice sunset on the lovely white sand beach there, but pretty crowded. Even better view from a nearby rooftop bar. Mat Cincang is the nicest Gunung on the island to look at with its numerous peaks and steep cliffs, but Raya is a fair bit higher and is therefore probably a better viewpoint. One of the great pleasures of Langkawi is its duty-free status, meaning cans of beer in minimarts are very cheap. I bought 4 and wandered back to my room. Drank one and promptly fell asleep! As I am not a fan of checking in luggage if I can help it, the next morning I got dropped off 2km before the airport, near the runway and the beach with lovely views of Mat Cincang, and drank the remaining 3 cans as I strolled in the hot sun to the airport terminal. Alas it was not Malaysia Airlines for the return flight but Malindo, little sister of the notorious Lion Air. Given all the instances of issues with Lion Air, not least just the previous day when a jet overshot Pontianak airport runway, I was horrified to find out upon landing in KL that there were no Malindo transfer counter staff and that my onward leg to Jakarta had been altered to…LION AIR. Took 30 minutes to get a new ticket printed out. Luckily the weather was fine and the staff professional but I gave a huge sigh of relief upon safely landing in Jakarta.